Life Every Day: Who's Cider You On? Jim went to the store on Sunday. He asks if I need anything. I say apple cider for Life Group on Tuesday. He says, "OK."
By saying "OK", I infer that he will return from the store with the exact thing I asked for. Is this not to be assumed? But Ooooh No. He comes back with Apple Juice. Something so terrible I shudder when other people give it to my children like it's a serving of fruit and good for them. Seriously, who made up that idea- that fruit juices like that are good for kids? If you're going to get that much sugar, you might as well take a Vitamin C chewable and chase it with a Mountain Dew. It would be nutritionally equal. Jim knows as much, but says it was cheaper, and it was the "same", right? So no biggie. I was totally annoyed. Which I told him. This of course, just makes him smile. That's how our marriage works, you know. I get annoyed, he just thinks it's funny. He's cute, I admit, I like him a lot, I get over it. This is how it goes 98% of the time. But of COURSE I went back to the store and got the real thing- because I was right and there is a difference and it is SO big of a deal. Just look at the difference in the two up there. Obviously, cider is made differently, has sediment which is tasty, it tastes more like real apple, since it's from fresh apples, not Frankenstein-Apple Concentrate, and so on and so on. Cider- though still full of sugar, is more purposeful in it's creation- made to be drunk in a mug, after being warmed with spices- you know, a special thing. These are the things Jim heard ad nauseum on Sunday. Now there's a giant gallon-sized container of Apple Juice waiting on top of my fridge for some moment when I absolutely know for certain I want to send my children straight to Sugar Coma Town, Population 4. Tried reading your entry, but after the kids' apple juice, tootsie-pop, Oreo and Fruit Loop (hey, it's healhty now, it has FIBER...) snack, they are now running around the house making siren noises and are speaking in a different language. I bet it was a good post, though. 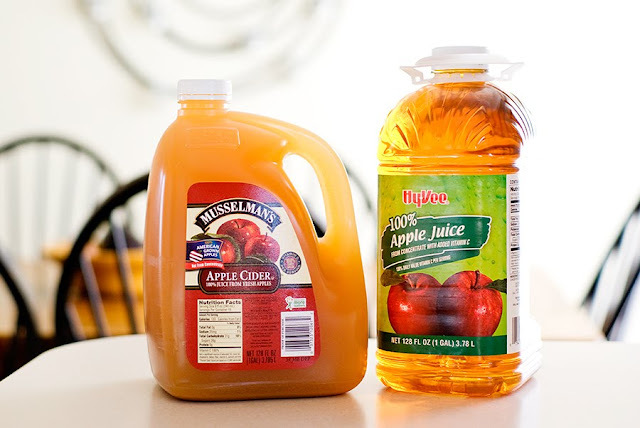 Now if you would compare 2 different kinds of apple cider (the cheaper varieties) they are identical. It's just that particulates are not worth 1.75. I could probably liquify some apple in a blender to produce the same result, just short the homogenization though (so it would settle, which would be even more realistic, don't you think?). It seems like such a man thing. I asked for Haagen-Dasz once because I had had a bad day and I got a carton of frozen yogurt. Whaaa?